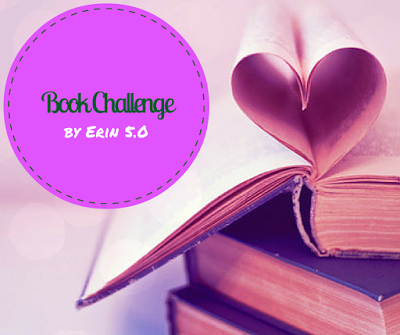 It’s officially the end of month 1 in Erin 5.0’s Book Challenge! I think I finished one book last year so I’m over the moon that my reading mojo is finally coming back. I think it helped that I had a week-long vacation and got some reading done! I’ll also tell you why I read it, what it’s about, and whether or not you should read it. The book images link you back to their GoodReads pages. I’d like to re/read all the Narnia books and this one is where I left off years ago. Plus it fulfilled a requirement for Erin’s challenge and the one with my friends. I know the order of books is debatable, but this one seems to pick up somewhere after The Lion, The Witch, & The Wardrobe. This book follows the story of Shasta & Bree on their journey to freedom. I think it hints at the value of humility and bravery and trust. It’s a light adventure tucked into a short, easy read. I love reading ‘the classics’ and I consider The Chronicles to fall into that category. I’d recommend this book for anyone looking for a feel-good, light, classic story. It’s kind of an odd pick, but I thoroughly enjoyed the book and found it easy to get through! My grandma recommended I read this book. A friend loaned it to her and she to me. Oh, my heart- I just completely and totally loved this book. It was the kind of story that you think about all day long. It told the story of Vivian (1929) and Molly (2011) and their struggles as orphans to find love, acceptance, strength, and family. This story had so much heartbreak but also so much resolution- it was an absolutely perfect mix. I’d honestly recommend this book to anyone, but especially those who love historical fiction. It’s a gorgeous work of art & storytelling. This book ended up on my to-read list via bloggers. (I can’t remember who- I’m sorry!!) I don’t usually read novels set in the future, but my weird interest in The Bachelorette drew me to this book. I’d say this is The Bachelorette meets The Hunger Games. It’s a little odd and a little futuristic, but it works. For me, at times this book was five stars and at times it was two. I loved the main character, America, but sometimes her love-triangle-situation annoyed me. I’m going to finish the trilogy, though. I’d recommend this one to those who like a strong female lead with a little romance and lots of dialogue. I chose this book because it checks the box on two different challenges. (Yay!) It’s a story about family, motherhood, India, and self-discovery told from multiple points of view. It spans from 1985 to 2004 and is set in India and California. When I started into the book I was afraid it woouldn’t resonate with me- it starts off with upper class and lower class struggles with motherhood. In the end, though, I found myself tearing up with every family moment and loving each character for their own personal growth. I’d recommend Secret Daughter to anyone looking for a warm story filled with culture. **I switch to Orphan Train instead of March and The Lady of the River instead of The Taming of the Queen. So I’m at 85 out of 200 points. I’m not very happy with the way I review books. I think I might revise it for next month. Thoughts? What did you read this month? 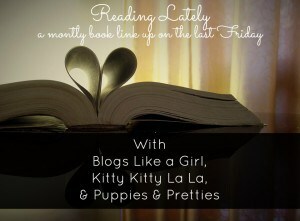 🙂 Linking up with Michelle, Cat, and Alison for Reading Lately! I haven’t read any of these. The Selection sounds interesting based on your description. Yeah, the love-triangle in The Selection was a little annoying, but I totally agree that the book is The Bachelor meets the Hunger Games…that’s literally what I said in my post about it! So funny. I’ve been eyeing The Orphan Train .. you’re making me want to go ahead & get it. Any of the books from the Narnia series are ones I can pick up, again and again! You’ve got me intrigued about The Orphan train, admittedly not normally my genre, but the story seems captivating and both you and your grandma loved it so I might see if I can get it from the library. I totally stand by my recommendation of Orphan Train! I’ve heard Orphan Train is so good! One of these days, I’m finally going to read The Selection. It is one of those that I keep meaning to, but never seem to grab. Thanks for linking up with us! I need to read Orphan Train one of these days! Right?? I honestly didn’t expect to love it as much as I did but I couldn’t put it down! I have the hardest time making it through The Chronicles of Narnia. I always have the best intentions, but can never seem to motivate myself to read past the first two books! I’ve read those a bunch though.I have a copy of the Orphan Train. It’s sounds like I need to make that one a priority! I love The Bachelor so I enjoyed the Selection Series quite a bit. Added Secret Daughter to my never-ending to-read list! I have a list of classics that I’d like to check off my list some day- all the books in The Chronicles of Narnia are on that list. Someday… someday… 😉 Definitely check out Orphan Train! I started the Chronicles a LOOONG time ago, so I’d like to start over and reread them all (except The Horse & His Boy). I highly recommend Orphan Train. And I want to start on #2 in The Selection series (I already have it from the library), but it doesn’t fit into the challenge I’m doing. Hahaha!